Tonight we launched an update to Showit to introduce a few new features and squash some minor bugs. If you haven't already... open up Showit and you should be prompted to install this latest update. One of the new features added gives you the ability to control the latest galleries with any text or image you want to. Now you can advance the images in a gallery... advance the thumbnails... play... or pause... with whatever layer best fits your site. 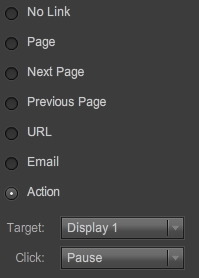 In the Link tab for any layer... check the Action radio button... match up the target with your thumb gallery and display area... choose the action for when the user clicks... and you're done! In addition to that, we've also added some new options for the galleries. You can choose to hide the current thumb gallery controls if you're going to take advantage of the new options mentioned above. 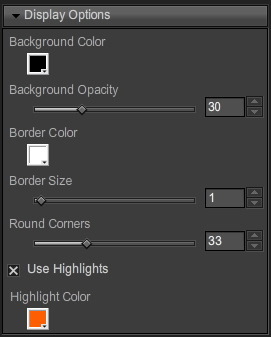 And you now have the ability to use a highlight color that will highlight the selected thumbnail and also highlight any thumbnail you mouse over. Another feature added that will definitely speed up organizing your site is the ability to quickly add blank style groups and pages right from the pages panel. 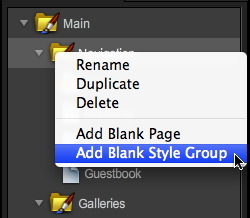 Make sure to right click on a style group in the pages panel and you'll see the new options in the displayed menu. We hope you enjoy this update and let us know if you run into any issues. OMG! Can I just give an AWESOME for this!!! So many times I've just wanted to add a new style folder on the fly, this makes it so easy! Well, as of today, there's still the annoying flashing scrollbars on smaller 4:3 monitors, at least with firefox 3.5.3. They flash on and off if you put the mouse on the page, disappear if you move the cursor off the page content. B.K. - Thanks for bringing this to our attention. Since your blogger profile is not public can you send an email to help@showitfast.com (without your email or website URL we can't look at your site). Please include your site URL in the email and we'll look to recreate this. Than we can take a look to see what we need to do to resolve this.